Northern India has been suffering unprecedented fog over the past couple of weeks. I had to contend with the frustration of air-traffic delays while stuck at Delhi airport for six hours last Friday waiting for visibility to improve sufficiently to allow my Mumbai-bound flight to take off. And peering through the doom and gloom of India’s Republic Day parade on Tuesday, you’d have been forgiven for wondering if the event were being hosted in northern Europe. The fog is of course of far greater significance to those for whom flying is an unlikely prospect. The homeless of north India have a miserable time while they contend with the chilly temperatures that accompany excessive fog. The official death toll this season has already passed the 500 mark. So I felt lucky to escape to the warmth of Mumbai last weekend. And now I’m enjoying moderate temperatures while working in Jharkhand where the nights are chilly but, thanks to a stubborn sun, the days warm to a very pleasant 25C. I do however have to admit to suffering a tinge of frustration because I’m missing out on the fog which, as all photographers know, can make for dramatic pictures. 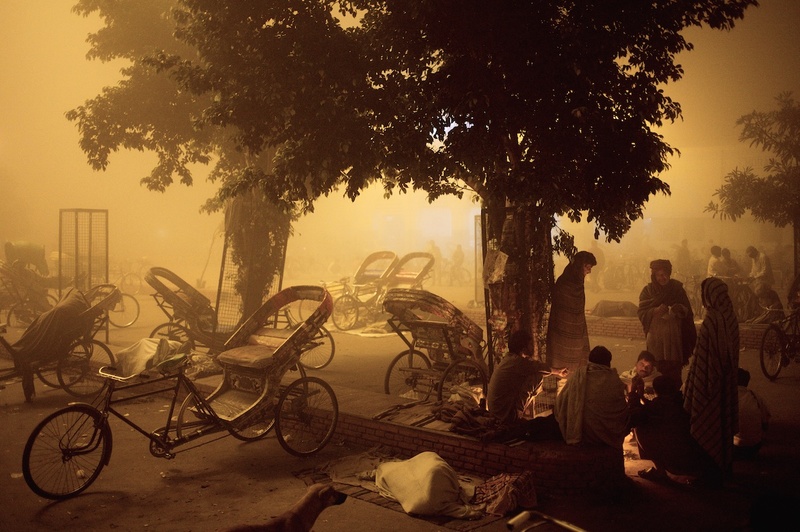 This photograph of rickshaw drivers grappling with the cold was taken before dawn while I waited for my Delhi-bound train to arrive at Moradabad station in northern India. I’d spent the previous week photographing a polio vaccination campaign for UNICEF and though this picture had nothing to do with the commissioned work, it was perhaps the most memorable image that I captured on that trip. As I find is so often the case in photography, it was the incidental moment, neither planned nor anticipated that yielded the most significant result.